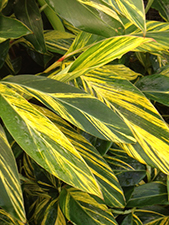 This bright yellow variegated shell ginger will add a splash of colour to your tropical garden. A hardy landscaping plant growing to 1.5m high in full sun to light shade. Prefers rich moist soil. Produces a pendulous spray of pearl white and pink flowers in summer.